"Keep writing those Brother and may your future seeds carry on the tradition" Tech N9ne, American Rapper. "A highly informative and highly insightful book" Jan Wong, Canadian Journalist. 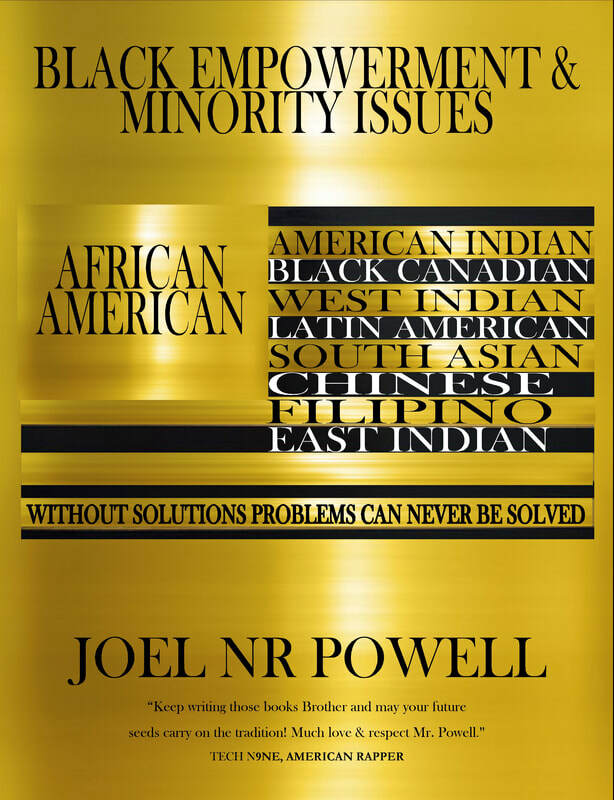 Joel NR Powell motivates readers to move past their concerns and notions in order to open up their minds to a broader level of enlightenment. He gives direct insight regarding issues related to family, employment, faith, health, finance, relationships and the law. Each chapter discusses problems and offers pragmatic solutions that will indeed motivate your mind, body & soul towards becoming more aware of the world that is around you. Black Empowerment & Minority Issues is a direct guide that encourages you to embrace your inner spirit and transform all struggles into a success story, not only for yourself, but for family, friends and colleagues around you. The empowerment will grant you the blessings and the knowledge that you so richly deserve based on actual growth and not wishful thinking. Its about understanding each other so we can bridge the gap. ​Description: A seven chapter non-fiction book designed to empower, educate, and enlist knowledge. Its aim is to convey a message to millennial where they can discover information naturally without the sense of feeling judged or criticized for their feelings. Category: Self-Help/ Health, Canadian, African American, Caribbean. Audience: Canadian, African American & Caribbean millennials between the ages of 18-30 that are interested in diversity and social issues within ethnic cultures, self-help & motivational books. Parents of these millennials who are looking to gain a better level of understanding of their children’s needs and wants will also benefit. Joel NR Powell motivates readers to move past their concerns and notions in order to open up their minds to a broader level of enlightenment. He gives direct insight regarding issues related to family, employment, faith, health, finance, relationships and the law. Each chapter discusses problems and offers realistic solutions that will indeed motivate your mind, body & soul towards becoming more aware of the world that is around you. Black Empowerment & Minority Issues is a direct guide that encourages you to embrace your inner spirit and transform all struggles into a success story, not only for yourself, but for family, friends and colleagues around you. The empowerment will grant you the blessings and the knowledge that you so richly deserve based on actual growth and not wishful thinking. It’s about understanding each other so we can bridge the gap. The factual stories and experiences will give the reader a sense of encouragement that they to are not alone with the problems they face in regards to family. With such high levels of unemployment the reader will learn how to develop the necessary drive and courage to pursue entrepreneurship. The reader will learn how to empower, educate, and enlist knowledge to ones self without feeling judged or criticized for their feelings. With so many health concerns and ailments the reader will gain better insight into the usage of natural health remedies, eating healthier, and respecting their bodies. The reader will learn how to understand the importance of money management, investing and getting out of debt. The reader will be able to learn how to trust, support & communicate better when building a relationship with someone they are fond of. The reader will become more aware of his/her rights in regards to dealing with the law and will be able to apply this newfound knowledge as a means of protecting themselves. numerous Colleges and Universities such as George Brown College, University of Toronto and many more. Please note that all speaking topics can be customized towards your audience needs.